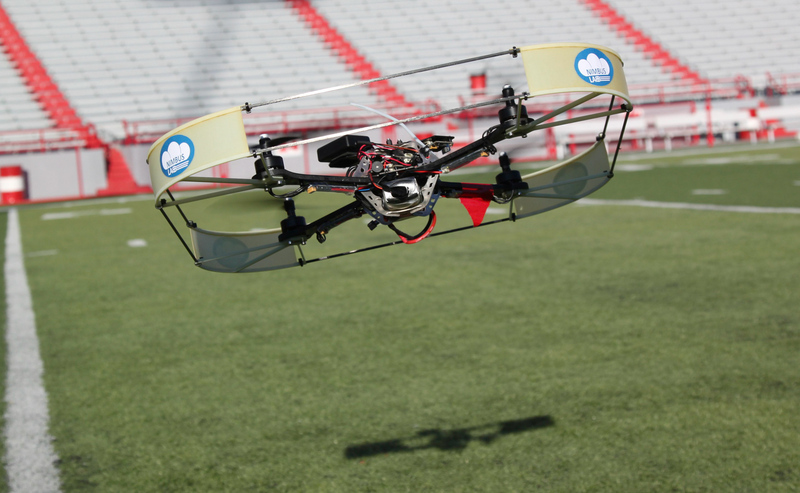 The University of Nebraska State Museum's February Sunday with a Scientist program for children and families will take a closer look at flying robots -- unmanned aerial vehicles also known as UAVs) The program will be 1:30-4:30 p.m. Feb. 15 from at Morrill Hall, south of 14th and Vine streets on the University of Nebraska-Lincoln City Campus. Professor Carrick Detweiler and professor Sebastian Elbaum of the UNL Computer Science and Engineering Department will showcase the cutting-edge capabilities of aerial robots being developed in UNL's NIMBUS (Nebraska Intelligent MoBile Unmanned Systems) Lab. Children and families can view live demonstrations of flying robots, build their own mini-paper helicopter, and learn how quad-rotor robots are used in agriculture. The scientists will explain how these flying robots assist with collecting water samples, monitor crop growth, plus more. Sunday with a Scientist is a series of presentations that highlight the work of scientists while educating children and families on a variety of topics related to science and natural history. Presenters share scientific information in a fun, informal way through demonstrations, activities or by conducting science on site. Sunday with a Scientist is 1:30-4:30 p.m. on the third Sunday of each month. For more information on the program and the museum, go to http://www.museum.unl.edu. For more information on the NIMBUS Lab, go to http://nimbus.unl.edu.